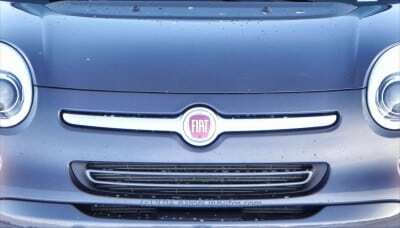 When Fiat came to North America, courtesy of their buyout of Chrysler, they quickly introduced their popular and iconic 500 two-door compact to our market. The fun, quirky little car was a hit, but has limited appeal due to its size and capability (or lack thereof), so it was obvious that the Italians would have to do something bigger. Enter the 2014 Fiat 500L, an all-new version of the little 500, this time with a limousine stretch to add two doors and a backseat. 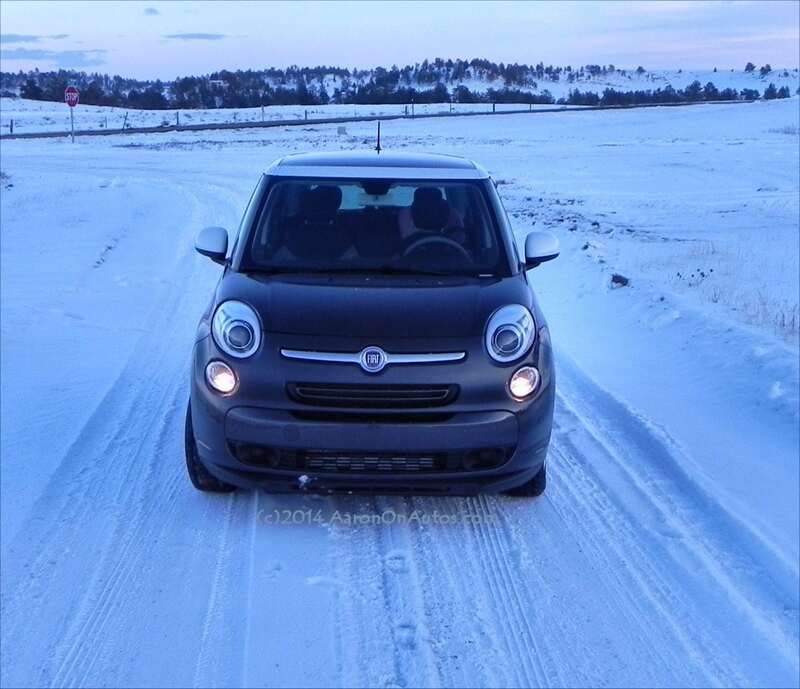 Everything about the Fiat 500 series is different. They are very unique in look, reminiscent of the long-ago Mini cars from BMW and of my personal favorite, the Citroen 2CV, but the 500 is entirely Italian. 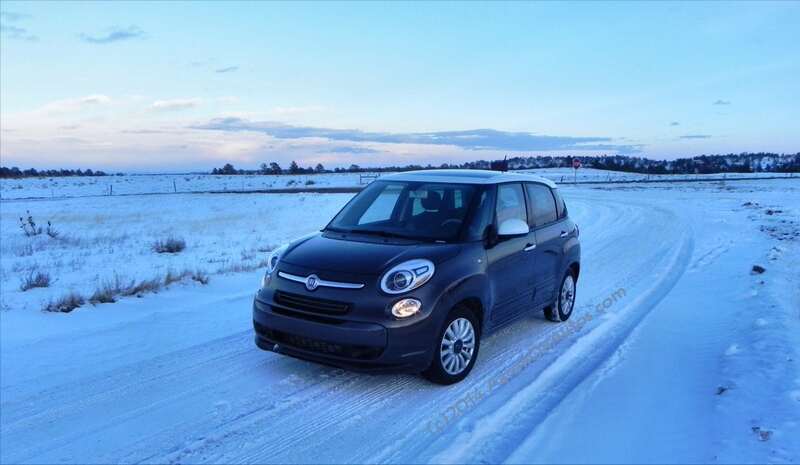 The larger, more versatile 2014 Fiat 500L is the same, iconic 500 with a longer wheelbase and larger interior: adding two doors, a larger back seat, and more cargo space. 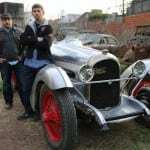 The drive train and appeal of the vehicle are still there. 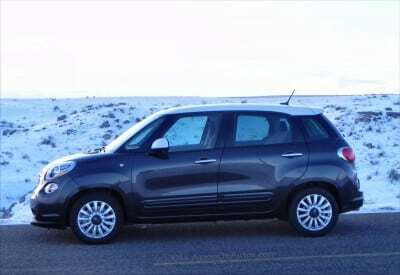 The 2014 500L gains about two feet over the smaller 500, making it a compact wagon on the order of today’s Mini Cooper Countryman – the vehicle it gets most-compared to, thanks to the shared square-ish shape. 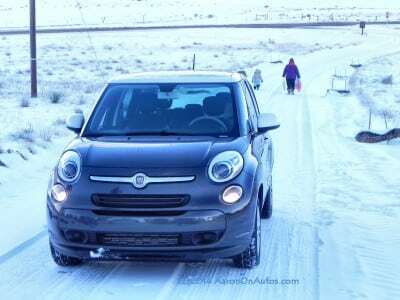 Like the Cooper, the 500L has huge appeal among the female crowd. 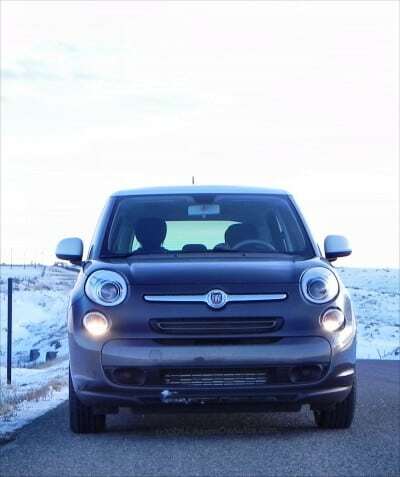 The front of the 500L has the same rounded nose of the little 500, with the big, bug-eyed headlamps, grinning grille, and abrupt transitions from grille to hood to windshield. 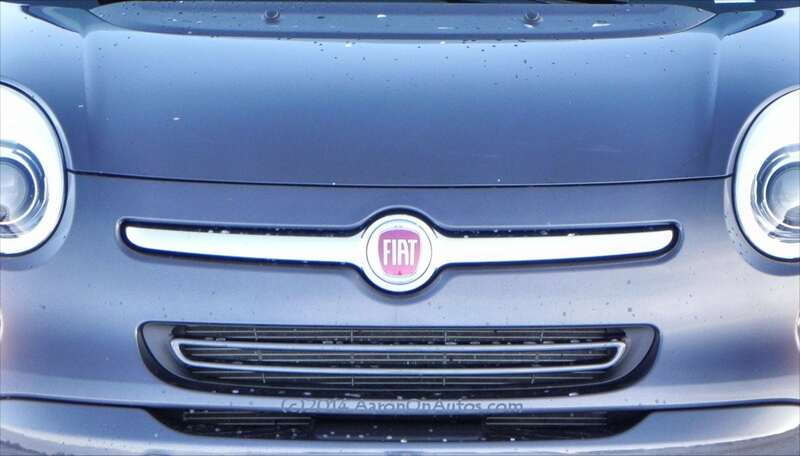 It’s distinctive and purely Fiat. The windscreen tapers up at a high angle and has a wraparound feel thanks to the unique side windows created to fill the space between the standard windscreen and the door. This is both stylish and practical, as it lowers the cost of replacement windows considerably. The roofline has the flatly tapering look of most of today’s small crossovers and people-movers, cutting off right after a small spoiler. The back of the 500L is tall and squared, but has rounded sides with round, protruding tail lamps to set it all off. Individually, components of the Fiat 500L are horrific, but all together, they make for a much more stylish vehicle than expected, proving the “whole is more than the sum of its parts” cliche. Colors are also well done. Our test model had a beautiful Gray Metallic finish with a white roof and side mirrors to set it off. Near-white alloy wheels, chrome accents, and those aforementioned headlights finish the appeal. It’s a great-looking car, no doubt about it. It has an almost universal appeal to women. 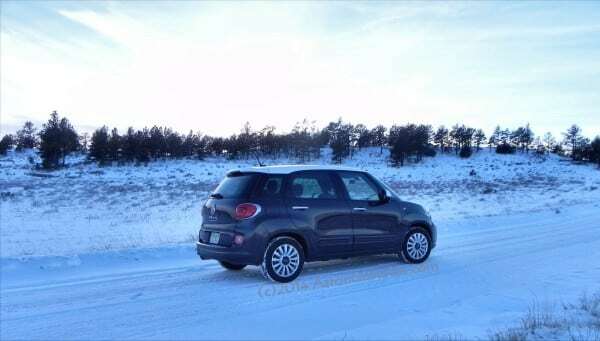 Fiat offers five packages for the 500L, starting with the Pop, then the Easy (as we drove it), the Trekking and the Lounge. 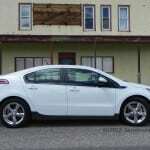 Each features specific options that can probably be deduced by the trim level’s name. Our Easy was focused on ease of use, it became apparent, and is the perfect package for small families. 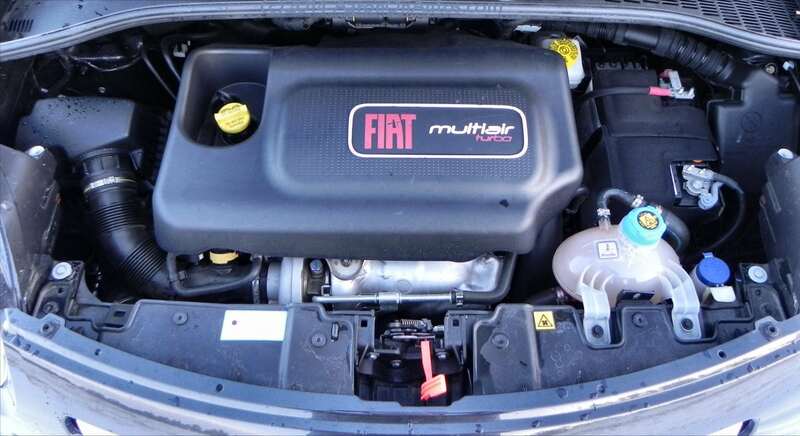 The little hood on the 2014 Fiat 500L covers the best part (to me, anyway) about this little Italian machine: its engine. The tiny 1.4-liter inline-four is the same as that found in the little 500 coupe, including the same signature Italian “pfft, pppbbbtt pfft” sound (listen to it here). It’s mesmerizing to listen to (though you’ll have to open the hood to do it, it’s so quiet at idle). On the road, that engine turbocharges its way to 160 horsepower through a six-speed transmission. The manual is standard (except in the Lounge trim), but the dual-clutch Euro automatic is preferred. By American standards, the Euro-style automated shifting is a bit clunky, but it doesn’t take long to realize that it’s just another quirky thing to love about this car. It’s not so horrid that you’ll feel the car is about to break at any moment, just different. 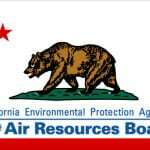 The 1.4L turbocharged engine gives the 2014 500L an EPA rating of 33 mpg highway and 24 in the city (27 combined). 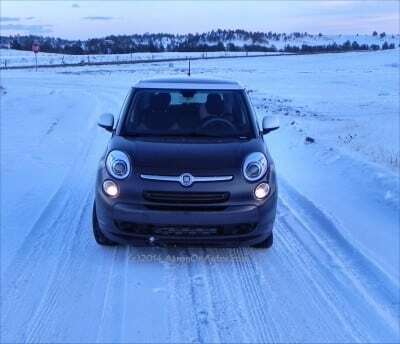 It doesn’t feel under-powered, despite its small displacement, and the 500L propels itself along nicely. 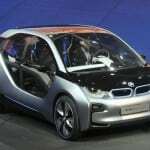 Although the car does feel like it has plenty of power for what it’s doing, however, it’s likely that a slightly larger engine (perhaps a 1.6L) would improve fuel economy by reducing the amount of effort taken to move the car at speed. 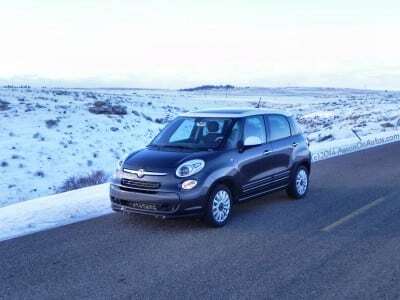 Still, the cost savings in keeping the same powertrain for both the 500 and 500L is obvious and will likely keep things as they are until the 500L picks up speed off the sales floor. This is the car’s first year on the market. Moving inside the 2014 Fiat 500L, we find a much roomier cabin than expected. From the outside, it looks small, but capable. Inside, it looks and feels huge. The square shape of the insides, the large panoramic roof (always recommended), and the wider feel of the body thanks to those slight bulges at the doors means the interior is set up for greatness. Fiat’s designers didn’t miss this either and the layout is very well done. 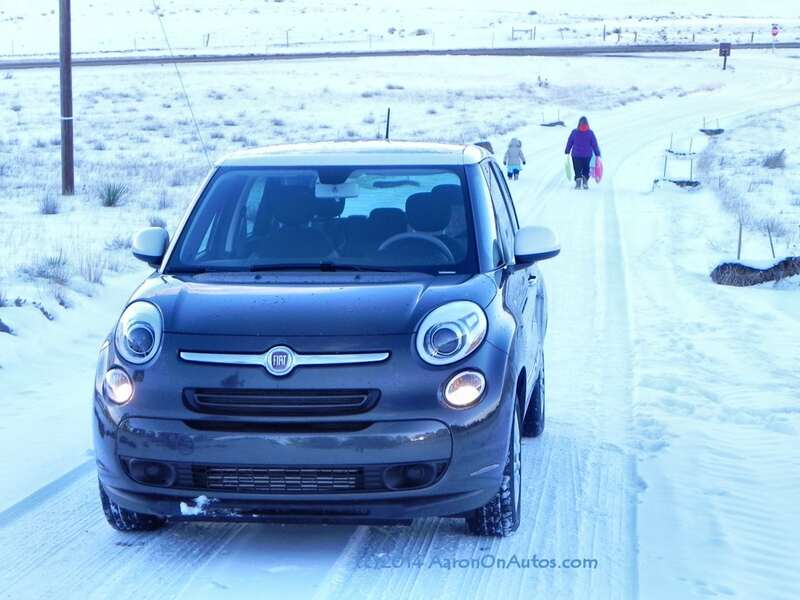 Seating is comfortable and spacious, entry/egress and interior ergonomics are well-considered, and the 500L just has a generally competent interior that doesn’t “wow” so much as it satisfies. Wow factor is nice, but satisfaction is what sells cars. 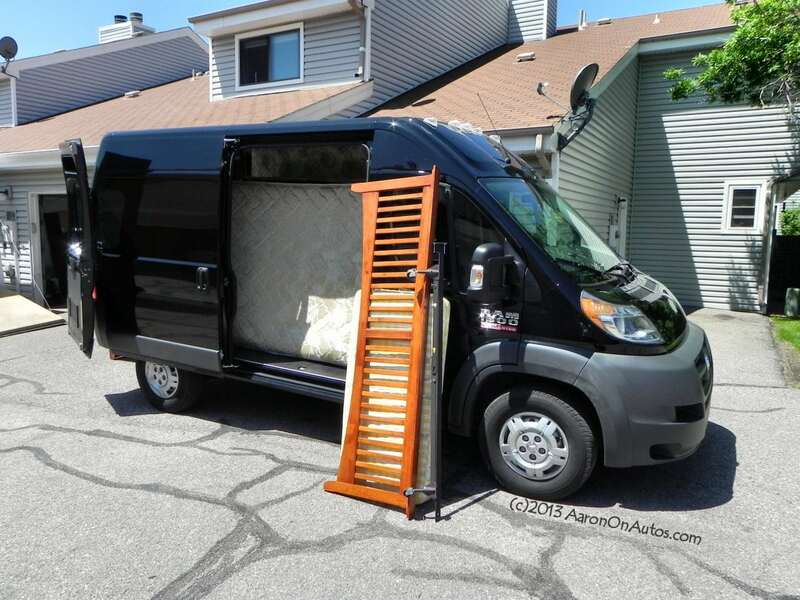 Cargo room is excellent and on par with any crossover in this size class. The back seat will easily fit two car seats with room to spare or three children in boosters. Two adults can sit comfortably and three can squeeze in if you must all get to the show at once. The Beats Audio package included with our test model was also a great addition, but unless you’re paying attention, you could get roasted by the seat warmers and not even realize it. 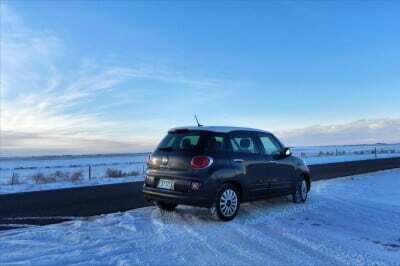 On the road, the Fiat 500L has a distinctive feel that is unlike most other vehicles you’ll drive. 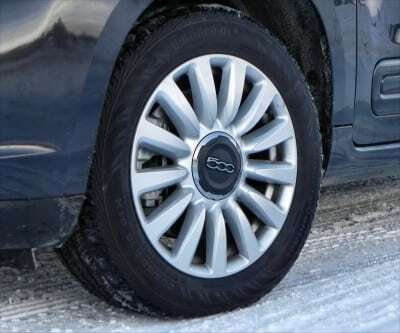 One of its quirks is the way that European transmission shifts, seeking the highest gear at all times and sometimes this makes the vehicle seem sluggish. Most of the time, that’s not too noticeable, but if you jolt forward in a parking lot or try to get into high-revs to go around someone, you’ll feel it. At highway speeds, though, its far smoother (thanks to that double-clutch) than most automatics can be. 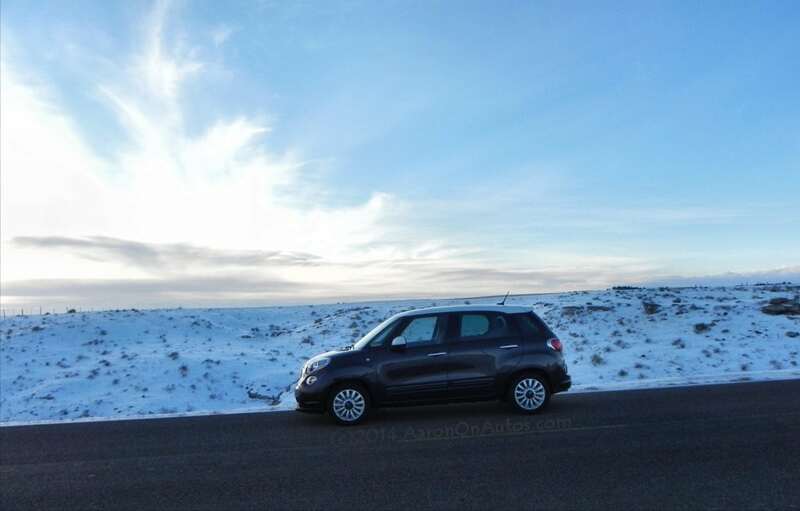 Outside of the transmission, though, the Fiat 500L has other little quirks that aren’t noticed until you’ve used them for a while. 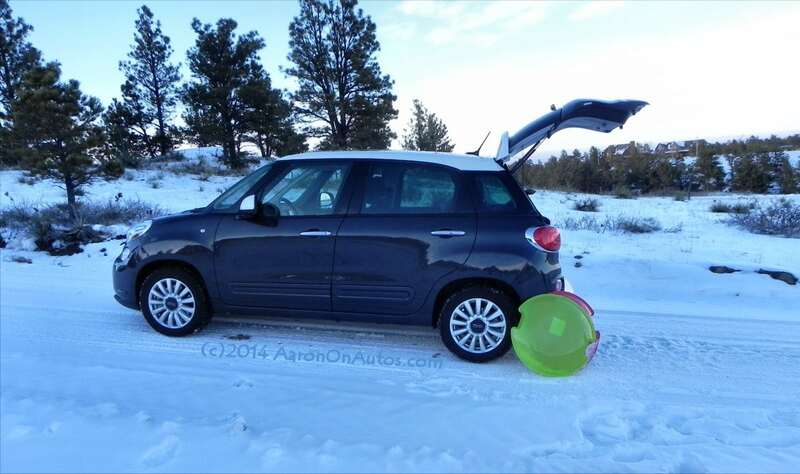 It steers and maneuvers well, has great visibility, and everyone notices you too (it’s a Fiat, everyone’s curious). The side windows can make sunlight come in at odd angles to splash across the dash at certain times of day, the panoramic roof’s opaque covering lets in various shades of outdoor lighting at night (more romantic than annoying, I’ll admit), and the 500L’s understeer is patently obvious on higher-speed corners (roundabouts and the like). Still, for all that, the 2014 Fiat 500L is a lot of fun and these quirks are part of its nature rather than things that must be fixed. Without them, it would just be a boring, square car with Italian looks but no heart. The most obvious competitor is the Mini Countryman we mentioned earlier. The Nissan Juke is another competitor. Some might say that the Mazda5 is competition as well, though being the owner of one, I’d contest that. The 5 is a minivan of small proportions, not a five-door MPV. 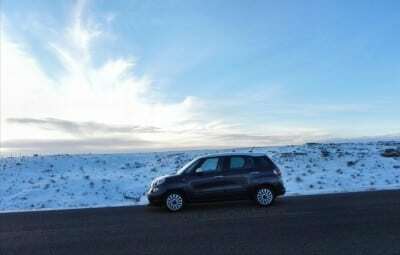 Comparing the 500L to these, we find that the Countryman is smaller in nearly every way (interior space, luggage room, fun factor, fuel economy) while the Juke is a close competitor for fun and luggage (and, in its way, looks), but not interior space. The Mazda5 is bigger and more versatile in every way, but still not as fun. 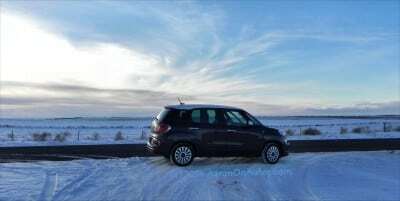 Other vehicles in the 500L’s price range, though only at their lower end, would include the Ford Escape and Toyota RAV4. Uniquely Italian in look and feel with lots of fun, quirky attitude that will endear it to people for the long-term. It’s one of those vehicles that you eventually give a name to like “Dopey” or “Penelope” (the name will invariably end with “ee”). Lots of goodies for a good price. 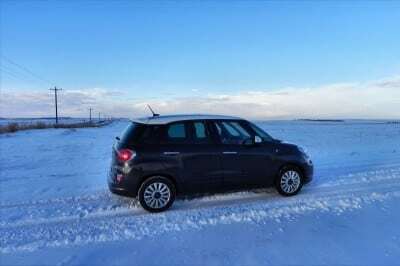 Could be more fuel efficient, as others with all-wheel drive capability and larger engines are meeting or getting close to the 500L’s EPA ratings. Some may find the automatic transmission hard to get used to. The 2014 Fiat 500L is a very fun vehicle with a lot of practicality to go with its Italian appeal. 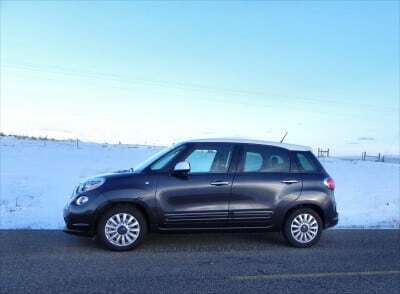 Unlike the guy at the single’s bar with the fake Italiano affect, though, the Fiat 500L is truly interesting and worth taking home. Our test vehicle was a manufacturer’s press loan, driven for about a week. During that time, we put about 452 miles on the vehicle, about half of which was a short day trip of mostly freeway driving. 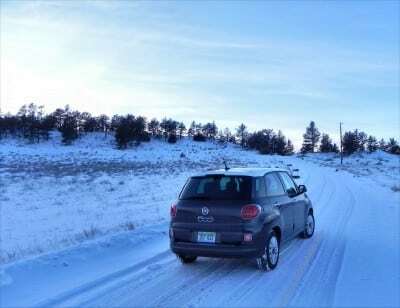 Other conditions included city, highway, and urban driving in varied winter weather.